The Nashville Inn, built in 1783, was the first hotel in Nashville. It stood at the corner of 2nd Avenue and what is now Union Street. Considered one of the grandest hotels in the South, it hosted many historic figures such as one of Nashville’s founders, James Robertson, and former Vice President Aaron Burr. Among its most frequent visitors was General, and future President, Andrew Jackson. Supposedly, Jackson's homecoming from the War of 1812 and his victory in the Battle of New Orleans was celebrated at the inn. Jackson and his wife, Rachel, frequented the hotel whenever they visited Nashville and the hotel quickly became a hub of social life for the Democratic Party. The inn was also where one of Jackson's famous duels took place. He was challenged by Thomas Hart Benton and Jesse Benton and was almost killed He stayed at the inn for three weeks while recuperating. The inn hosted other events as well, serving as Tennessee governors’s favorite site for hosting parties for dignitaries such as Martin Van Buren, James Monroe, and the future King of France, Louis Phillipe. During its operation, it served as the center of Nashville's high society, hosting weddings, balls, and other events for the Nashville elite. While the inn didn’t last long due to a fire in 1856, it helped establish Nashville as a hub of Southern politics and society. Untitled ~ Source: "Nashville Inn." Digital image. Tennessee State Library Archives . Accessed December 7, 2017. http://teva.contentdm.oclc.org/cdm/singleitem/collection/bernhardt/id/87/rec/4. 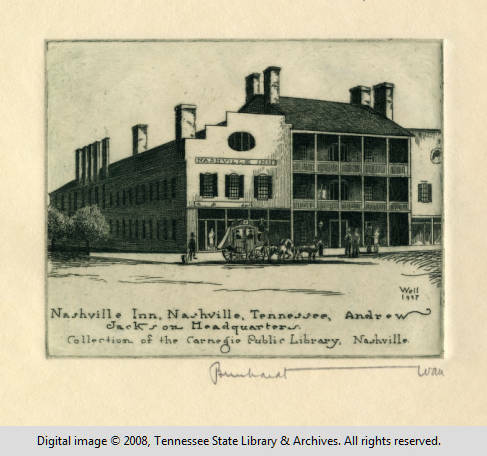 David Tucker, “The Nashville Inn,” Bygone Nashville, accessed April 25, 2019, https://bygone-nashville.mtsu.edu/items/show/25. Thruston, Gates P. "THE NASHVILLE INN." The American Historical Magazine and Tennessee Historical Society Quarterly 7, no. 2 (1902): 174-77. http://www.jstor.org/stable/42657126.